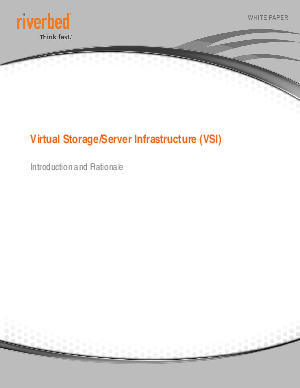 Virtual Storage Infrastructure (VSI) is a new technology that operates with some of the characteristics of both WAN optimization and VDI, but which can solve problems that those technologies cannot. Instead, edge-VSI enables a high performance stateless branch - where virtual servers and storage are managed at the data center, but execute with local performance at the branch. The Riverbed® GraniteT appliance is the world's first edge-VSI system, and is available today. Granite can be deployed on its own, alongside existing Riverbed® Steelhead® WAN optimization appliances, or as a feature of new Riverbed® Steelhead® EX branch office appliances.